Not to be confused with potassium sulfide. Potassium sulfate (K2SO4) (in British English potassium sulphate, also called sulphate of potash, arcanite, or archaically known as potash of sulfur) is a non-flammable white crystalline salt which is soluble in water. The chemical compound is commonly used in fertilizers, providing both potassium and sulfur. Potassium sulfate (K2SO4) has been known since early in the 14th century, and it was studied by Glauber, Boyle, and Tachenius. In the 17th century, it was named arcanuni or sal duplicatum, as it was a combination of an acid salt with an alkaline salt. It was also known as vitriolic tartar and Glaser's salt or sal polychrestum Glaseri after the pharmaceutical chemist Christopher Glaser who prepared it and used medicinally. 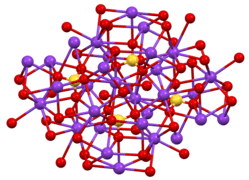 The mineral form of potassium sulfate, arcanite, is relatively rare. 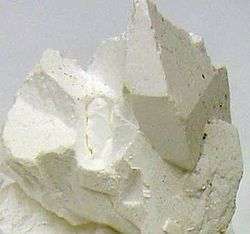 Natural resources of potassium sulfate are minerals abundant in the Stassfurt salt. These are cocrystallizations of potassium sulfate and sulfates of magnesium calcium and sodium. The potassium sulfate can be separated from some of these minerals, like kainite, because the corresponding salt is less soluble in water. Kieserite, MgSO4·H2O, can be combined with a solution of potassium chloride to produce potassium sulfate. The Hargreaves process uses sulfur dioxide, oxygen and water and potassium chloride as the starting materials to produce potassium sulfate. Hydrochloric acid evaporates. SO2 is produced through the burning of sulfur. Two crystalline forms are known. Orthorhombic β-K2SO4 is the common form, but it converts to α-K2SO4 above 583 °C. 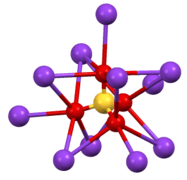 These structures are complex, although the sulfate adopts the typical tetrahedral geometry. It does not form a hydrate, unlike sodium sulfate. The salt crystallize as double six-sided pyramids, classified as rhombic. They are transparent, very hard and have a bitter, salty taste. The salt is soluble in water, but insoluble in solutions of potassium hydroxide (sp. gr. 1.35), or in absolute ethanol. The dominant use of potassium sulfate is as a fertilizer. K2SO4 does not contain chloride, which can be harmful to some crops. Potassium sulfate is preferred for these crops, which include tobacco and some fruits and vegetables. Crops that are less sensitive may still require potassium sulfate for optimal growth if the soil accumulates chloride from irrigation water. The crude salt is also used occasionally in the manufacture of glass. Potassium sulfate is also used as a flash reducer in artillery propellant charges. It reduces muzzle flash, flareback and blast overpressure. Potassium hydrogen sulfate (also known as potassium bisulfate), KHSO4, is readily produced by mixing K2SO4 with an sulfuric acid. It forms rhombic pyramids, which melt at 197 °C (387 °F). It dissolves in three parts of water at 0 °C (32 °F). 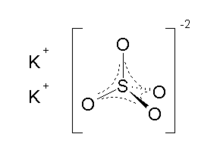 The solution behaves much as if its two congeners, K2SO4 and H2SO4, were present side by side of each other uncombined; an excess of ethanol the precipitates normal sulfate (with little bisulfate) with excess acid remaining. The behavior of the fused dry salt is similar when heated to several hundred degrees; it acts on silicates, titanates, etc., the same way as sulfuric acid that is heated beyond its natural boiling point does. Hence it is frequently used in analytical chemistry as a disintegrating agent. For information about other salts that contain sulfate, see sulfate. At high temperatures, it is reduced to potassium sulfide by the action of carbon monoxide. ↑ Windholtz, M (Ed.) & Budavari, S (Ed. ), 1983. The Merck Index, Rahway: Merck & Co.
↑ De Milt, Clara (1942). "Christopher Glaser". Journal of Chemical Education. 19 (2): 53. doi:10.1021/ed019p53. ↑ Klooster, van (1959). "Three centuries of Rochelle salt". Journal of Chemical Education. 36 (7): 314. doi:10.1021/ed036p314. ↑ Gaultier, M.; Pannetier, G. "Structure cristalline de la forme 'basse temperature' du sulfate de potassium K2SO4-beta" (Crystal structure of the "low temperature" β-form of potassium sulfate) Bulletin de la Societe Chimique de France 1968, vol. 1, pp. 105-12. ↑ "Super K (Potassium Sulphate)". Retrieved 7 December 2014.